The Pavilion is a spectacular events space featuring a domed ceiling, floor to ceiling windows, wraparound balcony and stunning city views. This versatile semi-circular room is perfect for cocktail, banquet or theatre style events. Hugh Williamson Room - This versatile and inspiring space is ideal for cocktail functions, intimate dinner parties or boardroom style meetings. Members Lounge - Ideal for half day conferences, breakfast or cocktail events, the Members’ Dining Room is an open, light filled space featuring a full service bar & private bathrooms. Amcor Lounge - The Amcor Lounge is a contemporary, light filled events space which features a vibrant backlit wall. This versatile space is ideal for conferences, cocktail events, dinner parties or boardroom style meetings. Plaza Room - The intimate Plaza Room, is ideal for meetings, cocktail functions and small dinners. The large window provides natural light, along with views towards St Kilda Road and the Queen Victoria Gardens. Melbourne Room - The Melbourne Room is the ideal venue for exclusive dinners, cocktail functions or boardroom meetings. This elegant space boasts a unique circular shape and exquisite hand printed Florence Broadhurst wallpaper. Beneath the ballerina’s skirt is one of Melbourne most loved, most iconic venues. Arts Centre Melbourne is regular host to world class performances and spectacles. And you too can host your own spectacular event within our beautiful venue. Picture hosting a gala dinner on the State Theatre stage, the Melbourne Symphony Orchestra serenading your guests, the deep red of the theatre cascading behind. Imagine holding your Christmas party in the Pavilion, with its rich tones, stylish interior and balcony overlooking the Melbourne skyline. Or perhaps you’re after a simple, beautiful boardroom, bathed in natural light for your next meeting? Our venue is as versatile as it is unique. With no two spaces the same, you are spoilt for choice when it comes to finding the perfect fit for your event. Arts Centre Melbourne is located in the heart of Melbourne’s arts precinct. Overlooking the Yarra River and boasting stunning city views, the venue is within a five minute walk of Flinders Street Station, meaning it can easily be accessed via train or tram. Its central location also puts it within easy walking distance of many of Melbourne’s premium accommodation offerings. Arts Centre Melbourne prides itself on delivering a truly exceptional hospitality experience. With a passion for flavour, freshness and innovation, the in-house culinary team have crafted a suite of menus that showcase the very best in local, seasonal produce. Tailor made menus can be designed to suit the style and theme of each event, with matching local wine for each dish. Dietary requirements are well catered for with specially crafted dishes for those with specific requests. Arts Centre Melbourne boasts an in-house team of highly-experienced audio visual technicians, along with state-of-the-art equipment, which is available within each of the venues event spaces. Each event is assigned a dedicated AV technician, ensuring all AV requirements are delivered seamlessly and professionally. Complimentary internet access is available for all guests upon request. 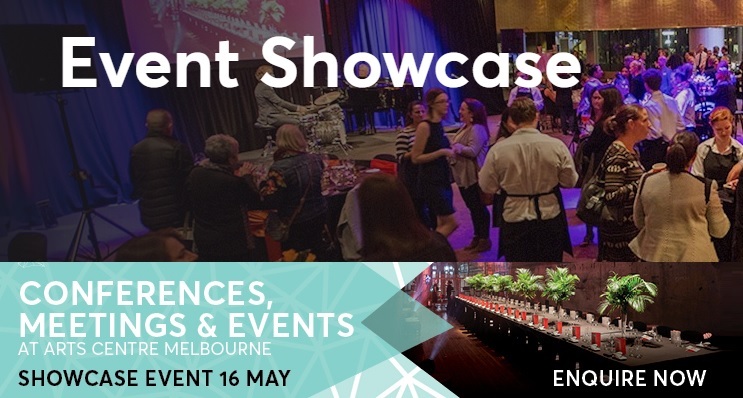 Submit your interest to attend Art Centre Melbourne's Conferences, Meetings & Events Showcase. Major door prize sponsored by Singapore Airlines PLUS additional door prizes from our fantastic performing arts partners. Arts Centre Melbourne peer behind the curtain of event spaces and reveal a space that is enveloping, yet open; distinctive yet comfortingly familiar. Situated underneath its iconic spire, Arts Centre Melbourne boasts an extraordinary collection of art filled event spaces. Featuring 10 function rooms, four theatres and dedicated pre-function areas, Arts Centre Melbourne is perfectly suited for meetings, conferences and special occasions. 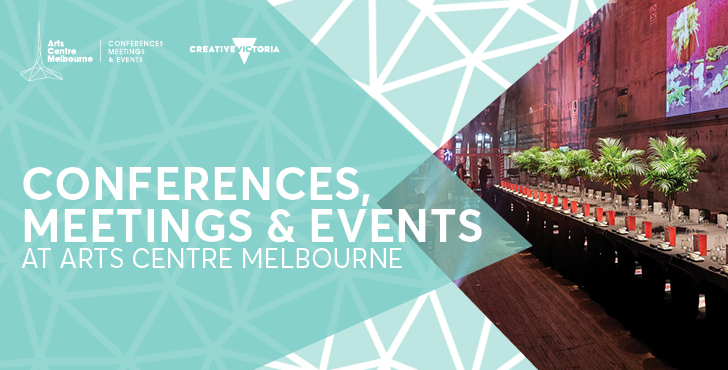 Arts Centre Melbourne boasts an exceptional culinary offering, an experienced and professional events team, state-of-the-art audio visual capabilities, onsite car parking, access to a broad range of talented performers and much more.